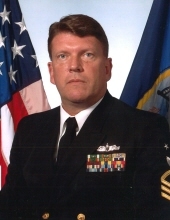 CTRCM(SW)(Ret) Daniel John Garrity, Sr. Celebrating the life of CTRCM(SW)(Ret) Daniel John Garrity, Sr.
Be the first to share your favorite memory, photo or story of CTRCM(SW)(Ret) Daniel. This memorial page is dedicated for family, friends and future generations to celebrate the life of their loved one. Obituary for CTRCM(SW)(Ret) Daniel John Garrity, Sr.
CTRCM(SW)(Ret) Daniel John Garrity, 58 of Pace, FL died peacefully at home with family by his side on February 10, 2019 after a 6 year battle with cancer. Dan was surrounded by his loving family and friends until the end. Despite his condition, he never went a single day without enjoying life and always had a smile on his face. Born June 18, 1960 in Newark, NJ to Joseph and Frances (Smith) Garrity. Dan served proudly in the US Navy for 26 years. He was a distinguished Navy leader and had a tremendous impact on those who served along side him. During his retirement, Dan enjoyed golfing, boating with his wife and spending time by the pool watching sports with family and friends. He cherished his time with those he loved dearly. Dan was an inspiration to everyone he met and was the glue that held hundreds of people together. Dan was preceded in death by is loving parents Joseph and Frances Garrity, and siblings Joseph, James, Michael and Kathleen. He is survived by his beloved wife Stephanie of 25 years, his sons Daemon, Ryan, Daniel and Brendon, his sister Maureen Pollio (Paul) and his darling grand daughter Aslynn. The service for Dan will be held on Thursday, February 14th at 10:00 am at Faith Chapel Funeral Home North, 1000 S. Highway 29, Cantonment, FL, 32533. Visitation will be from 5:00 pm to 7:00 pm on Wednesday, February 13th at Faith Chapel. Interment will be at Barrancas National Cemetery. A Celebration of Life will be held directly following the Interment at the family home. Dan will be forever loved and remembered. The family wishes to express their gratitude to VITAS Hospice for providing compassionate care. Faith Chapel Funeral Home North entrusted with arrangements. You may express your condolences online at www.fcfhs.com. To send flowers or a remembrance gift to the family of CTRCM(SW)(Ret) Daniel John Garrity, Sr., please visit our Tribute Store. "Email Address" would like to share the life celebration of CTRCM(SW)(Ret) Daniel John Garrity, Sr.. Click on the "link" to go to share a favorite memory or leave a condolence message for the family.